Let’s get this day started shall we? To celebrate a great first year of business, we are hosting FOUR spectatcular GIVE-AWAYS! The prizes will be a combination of products from Opal + Wonder and New Crop. So exciting! We were so happy when New Crop agreed to collaborate with us on these awesome give-aways! Aaron and Charmie of New Crop have been living the dream, traveling the world while gathering all sorts of treasures for their shop. They recently came across some amazing hand embroidered clutches in Thailand that we fell in love with. The detailing is spot on and they even have a colorful hemp bracelet tied to it! We paired them with some Opal + Wonder goodness to create bundles of happiness for you! 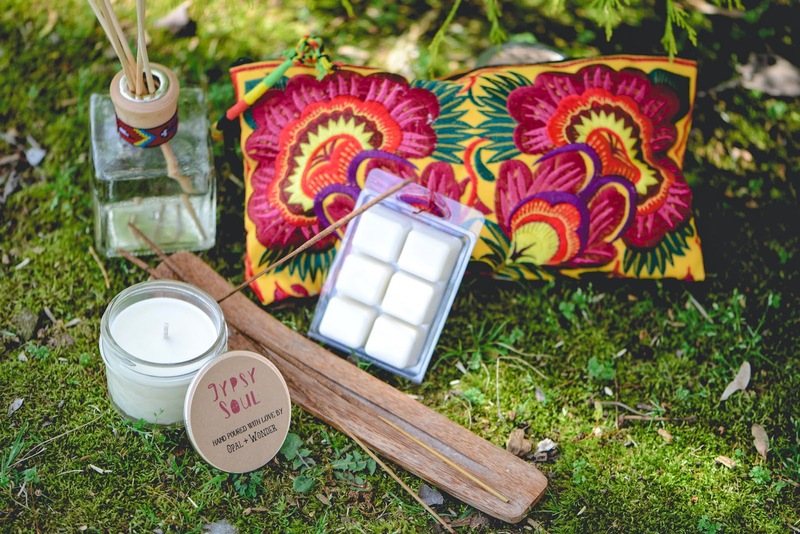 So not only will someone get love from Thailand, but each give-away also includes a candle with one of our new scents: Gypsy Soul or Drum Circle! There will be a winner announced each week! Don’t miss out! And afterwards, check out more items from New Crop here! Thanks for a great giveaway Opal and Wonder! Cannot wait to check out New Crop! Thank you for the giveaway! I just ordered my first candles! I love the colors in the clutch! Thanks so much for the giveaway! Love the clutch. So colorful and vibrant! Love the candles! Thanks for the giveaway! I love your candles! Just got the Beautiful People scent. Makes the whole living room smell divine! The scents sound fantastic, and the clutch is so vibrant! It would be a joy to win; thank you for hosting this giveaway!